I'm very happy to officially introduce you to my very talented and dear friend Kate and invite you to get to know her wares in her brand new shop: Woolen Moss. Oh, I've wanted to say that for so long! Kate is a friend, neighbor, fellow mother and artist. But I also know her as the champion seamstress I enlisted to help me through a huge wholesale deal. Her workmanship is impeccable and I can attest to this personally. Now she's putting those skills to use to highlight her own beautiful designs. And did I mention that she lives on a sheep farm with a creek running through it? 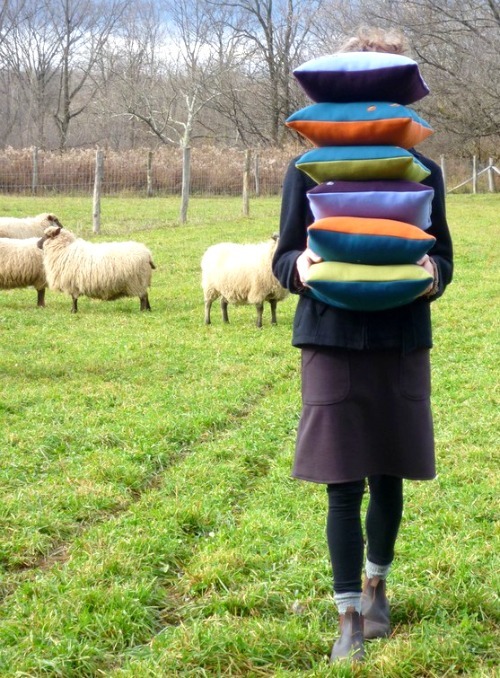 This influences her textiles greatly and the focus tends to be wool. She also incorporates tiny smooth stones into some of her work. "I'm Kate of Woolen Moss Farm. I am a shepherdess, a sculptor, a seamstress, and a mother. I earned my BFA in Sculpture in 2000. Although I have been sewing with my mother and grandmother since I was a child, I did not sew professionally until I returned to college and rediscovered my passion for making. The birth of my son in 2003 only fueled that fire, and the purchase of my sheep a few years later seemed to bring it all together. Combine my tea drinking and my insatiable stone collecting, and you've got the person I am today. I believe that my work is an honest reflection of who I have become." Thanks Kate! I'm so glad you're here. 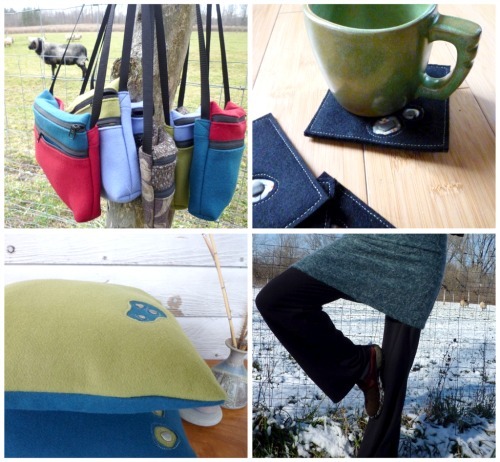 If you're looking for something exceptional and handcrafted with the utmost of care, look no further than Woolen Moss to find: cushions, handbags, coasters and a wide variety of cozy, practical, and stylish skirts. Great store. Thanks for letting us know about it. I particularly like her skirts. Look very cozy. Woolen Moss beautiful! I will be back to shop. I am so in love with that blue spruce skirt! I hopeing Santa will put it under the tree for me! love your picts with the sheep! Tres cool while warm at the same time! what a fabulous neighbor to have ! !